And we're in the home stretch! I think that's how that saying works, I'm a football girl! Anywho, welcome to part four of my moving series. 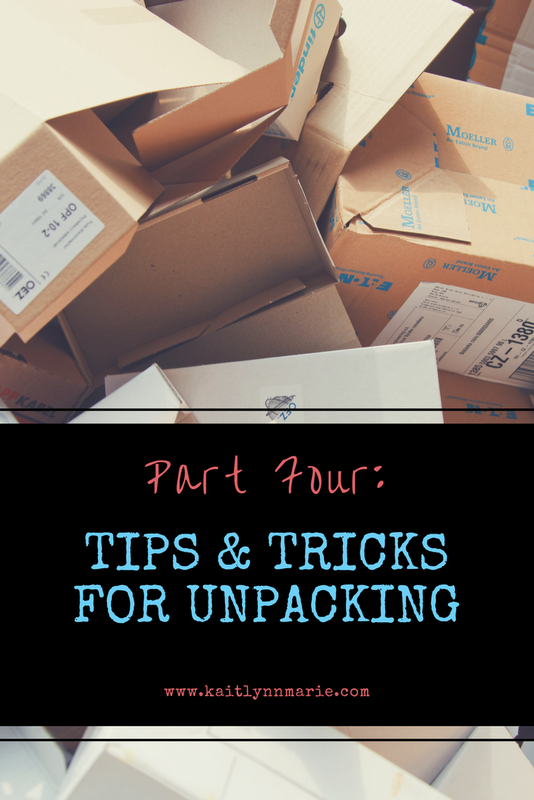 This is the final installment, all about unpacking. I'm sure I'm not the only one who hates unpacking just as much as I hate packing. It's just as tedious, and not exactly satisfying until the very end. And even then, it can just be so frustrating! This being part four, you can find parts 1-3 here. I've always hated the entire moving process. It's not just a quick, one day thing. You have to find a new place, which takes time, then you have to pack, which also takes time. Moving can usually be done in one or two days, but then unpacking also takes time. I can tell you, we moved into our new place the beginning of July and we're still unpacking. I'm pretty sure regardless of when this goes live, this statement will still be true! When we moved out of the previous apartment I had totes that had been packed since before we moved into that apartment two years earlier! Over the years I've developed some skills to make unpacking just a little bit easier. One thing I try to do is minimize garbage. This is typically done in the packing stage, but you can also try to do this while unpacking. It might seem weird, but hear me out. If you packed in boxes, when you're unpacking take one box at a time and decide if you can keep it. If you can, carefully break the box down and store it. If not, obviously it's garbage. Still break it down, and recycle it. Try to avoid breaking things, so don't place them in precarious positions. And for the love of all that is holy, keep the breakables away from the cat! Mine is very mischievous and will knock pretty much anything off any surface. 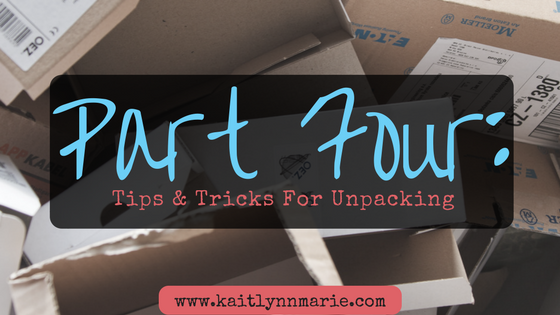 You'll also want to try to visualize where things should go before you take them out of the boxes. Have all your furniture in place before you start on boxes. Right now, I only have a bedroom to think about. When we moved into our current apartment I knew it would be smaller than my old bedroom, and also have a build in shelving unit. That shelving unit is what they consider a closet, and I guess it would work that way if I actually wanted it to. I knew I would be using the space under the tallest shelf for a set of drawers I have, and I knew I wanted my bed to go against it. I also knew where I would be putting my chest and desk before I started unpacking. Once those were in place, I moved on to the boxes. If you can, and if you packed right, you can take it one furniture item at a time. What I mean by this is, if you packed everything from your chest/dresser into one or two boxes, you can then take those boxes and unpack them right into your chest/dresser. Then you can move onto the next piece of furniture and keep the momentum. Once a box is empty, it's best to remove it from the room. You don't have to make constant trips to the trash, but you shouldn't keep empty boxes in the room. It will just make the room seem cluttered and it will likely drive you insane. Any trash you encounter, broken things, things you decide you don't need/want after moving, and any paper used for fragile items, should be put into a box to be thrown out. You definitely don't want to just drop the papers on the floor. I've seen people (usually kids) do this many many times. Also try to avoid taking on more than you can handle at any given time. If you can't find a place for every item you take out of a box or tote, you'll start putting it on your bed, or in a random place. Then you'll end up overwhelmed because there are too many things and not enough places for them. Take it one thing at a time, and try to avoid clutter. Do you have any additional tips or tricks to make unpacking easier? Have you enjoyed this series? Let me know in the comments below! Thank you for sharing such an easy tips for unpacking after moving in your new home. Retro Removals is top rated and one of the best Moving Services in Perth.